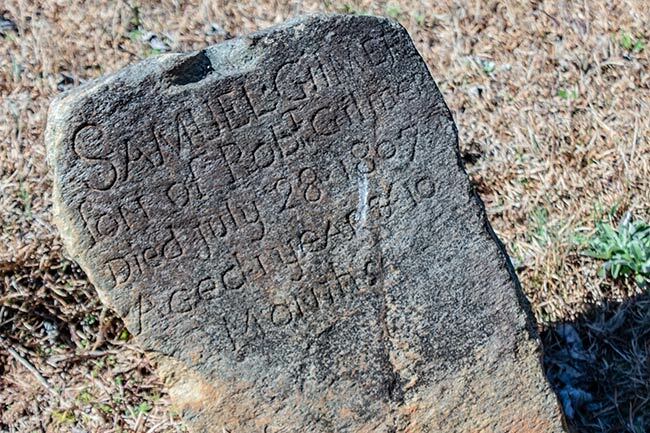 Long Cane Cemetery (also known as Upper Long Cane Cemetery) is the oldest cemetery in Abbeville. Established in 1760, the grounds contain more than 2,500 marked graves. 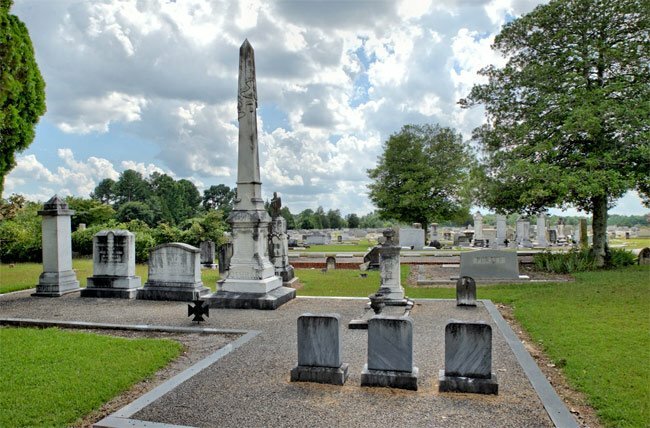 The storied pasts of some of South Carolina’s first Scots-Irish immigrants lend to the cemetery’s significance. 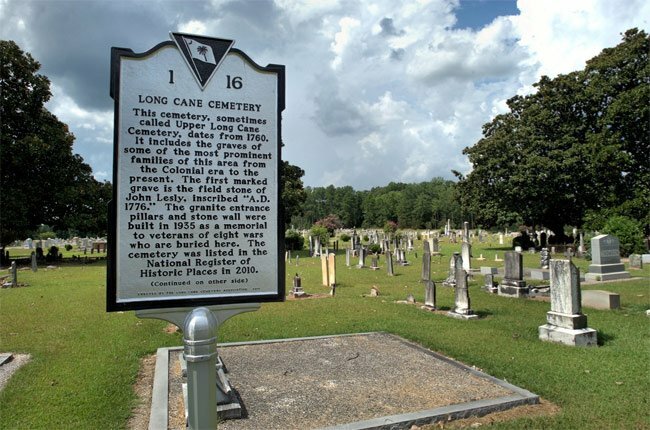 Many of upper South Carolina’s earliest settlers are buried at Long Cane Cemetery, along with several of the state’s most prominent families. United States Congressman James Sproull Cothran (1830-1877) is interred at the site, as are a number of Alstons and Calhouns. The cemetery also serves as a museum of sorts. Three generations of noted sculptors and stone carvers created many of the headstones found in Long Cane, and their “signatures” can be seen etched in the marble, slate, and granite markers. These artisans were primarily from the Walker and White families, and inscriptions include those from Rowe and White, Edwin R. White, John White, Robert D. White, and William T. White. Upper Long Cane Cemetery, established ca. 1760, is significant as the first cemetery in the vicinity of Abbeville, for its association with the settlement, early growth, and development of Abbeville and Abbeville District, and for its association with prominent area families and individuals of the late eighteenth century through the first half of the twentieth century, including numerous persons important to the city, county, state, and nation. 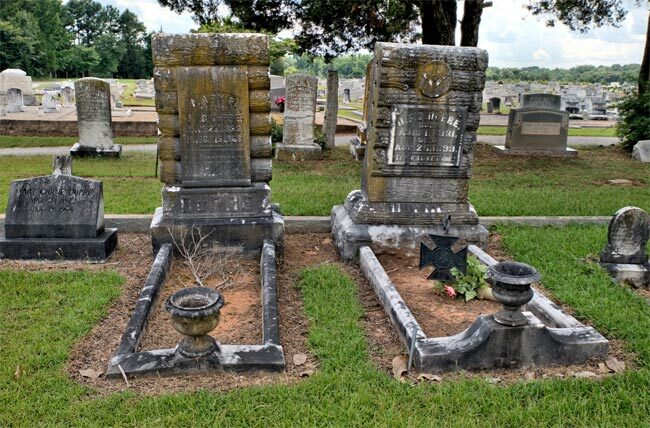 Few cemeteries in South Carolina can rival Upper Long Cane Cemetery for its association with, and ability to convey, the history of a town, its county, its region, for such a long period. Upper Long Cane Cemetery is also significant for its concentration of outstanding gravestone art by master Charleston, South Carolina stonecarvers, skilled artisans who were part of a three-generation lineage of outstanding sculptors in nineteenth century South Carolina belonging to the Walker and White families. There are more than fifty gravemarkers “signed” with the stonecutters’ names on them or attributable by style to particular carvers and their shops, most notably those carved by stonecutters Rowe and White, John White, William T. White, Robert D. White, and Edwin R. White. The cemetery contains more than 2,500 marked graves, many of them in family plots or sections, and an unknown number of unmarked graves, on approximately twenty-five acres. Most grave markers, carved from marble, granite, sandstone, or slate, are headstones (some with footstones), although there are also numerous obelisks, pedestal-tombs topped with urns or crosses, box tombs, table-top tombs, tablets, and other markers of varying materials and shapes. Funerary art ranges from simple engraved tombs, tablets, ledgers, and monoliths to more ornate draped tablets, obelisks, columns, or shafts, with ornaments including such motifs as angels, doves or lambs, open Bibles, weeping willows or palmettos, and flowers, wreaths, and ivy. Yes, hope you can help me I’m trying to find one of my ancestors Thomas J Hill born abt.1811 died 1866. 1860 census showed his last residence Abberville, SC Residence: Post office: Diamond Hill. I am trying to find where he is buried. 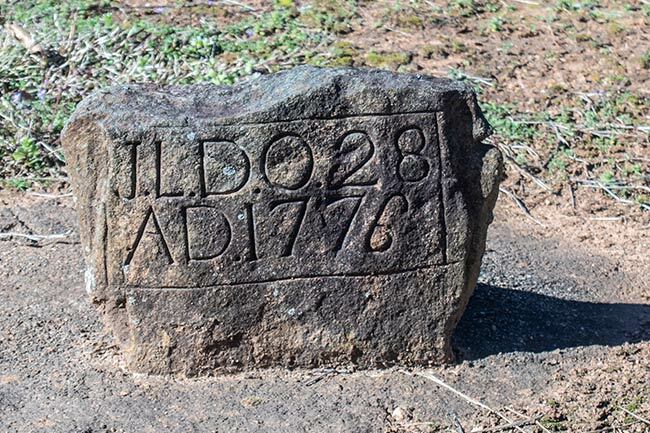 I believe my 7th great-grandmother, Isabella Lockridge, was buried at Abbeville in 1771. However, we are not sure which cemetery. Could you please tell me if she is buried at Long Cane? Thank you. My grandfather was Thomas White Nickels. He had a farm in Abbeville. Was he related to the other Whites that did the sculpting? He’s not buried in Long Cane Cemetery. 1833-1897? What a beautiful little city. My James Adams ancestors were from here after leaving Virginia. I hope some day to visit you. Do you have an active Historical Society? I am in desperate need of finding out where my 3rd great-grandfather Patrick Noble Wilson is buried. I estimate his death was between 1872-1880. He was born in Abbeville in 1839 (some say 1841.) He survived the Civil War, returned home, then no more information. My suspicions led me here because I have several of his family members listed as being buried here. I have searched computer records to no avail. Have also visited cemetery many times. Thanks. Hello Daniel, thank you for the question. We searched Find a Grave to see if Jean (Jane) Bailey’s internment was listed but it was not. We did do a name search on the same website but found no listed result for her place of burial yet. This is where we looked: https://www.findagrave.com/cgi-bin/fg.cgi?page=cr&CRid=71574. I would like to know if Jean (Jane) Bailey (1723 – 1792) is buried here? Thank you. I would like to know if William Stone, Sr. is buried in this cemetery. He died in 1812 and was buried in Abbeville. Thanks for your help. I would like to know if Willis Scoggins and Unity Scoggins are buried here. Willis passed away in 1845, and Unity passed away 1850s. I would like to know if there are any Woodalls (Wooddalls) buried in this cemetery. My forefathers came to Long Canes in 1766. I forgot to mention my Grandfather’s name was William Couey. I believe my 5X great-grandfather and other family members are interred in this cemetery. It’s wonderful to see such great photos of this cemetery, as well as the information you’ve shared. Thank You! Do you have a list of people buried in this cemetery? I am trying to find the grave of my great, great, great, great, great, grandfather, William Bonner.